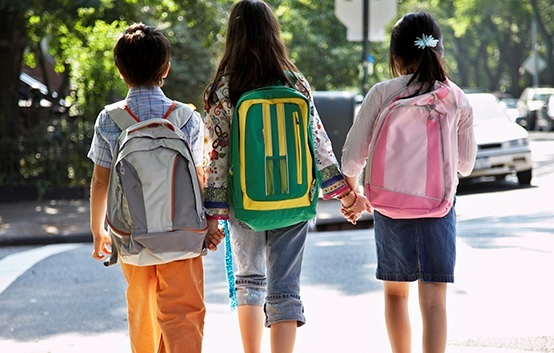 Backpacks have an important role in impacting in the growing and developing bodies of children. Due to the amount of time our kids have them on. Saying this, heavy or poorly fitted backpack can affect a child’s musculoskeletal health—both today and in the future. It’s time to review a few guiding principles to prepare your child for school, keeping their health in mind. It’s too common to see children trotting along to school, back hunched forward to balance a heavy or over-sized bag. Unfortunately, carrying such heavy loads long-term can cause problems to a child’s musculoskeletal system, and result in back pain—among other things. For example, children may condition their bodies to lean forward, arch their backs, and lean to one side. Prolonged repetitive strain on their spine or Creep can settle in the spine. Muscle then become fatigued and strained. This type of physical stress can also alter a child’s posture and gait. So how can these health consequences be prevented? It’s simple—help your child choose the correct backpack which will fit their body and is adjustable as they grow. 1. The backpack should be between 10 to 15 percent of the body weight of the child. 2. Distribute the weight of the bag evenly across the back. The more spread out the load. The less strain there is on their developing body. 3. Make sure the child wears both shoulder straps. Wearing a backpack over just one shoulder can cause leaning to one side, which over a prolonged time could curve the spine over time. 4. Adjust shoulder straps so the backpack fits closely to the upper part of the body. The further a backpack is away from the body, the more difficult it is to achieve proper balance and the body has to over compensate. 5. The backpack should never hang more than four inches below the waistline. 6. A backpack with individualized compartments helps in positioning its contents most effectively. 7. Bigger is definitely not necessarily better. The more room there is in a backpack, the more your child will carry and the heavier the backpack will likely be. 8. Finally, the shoulder straps should be adjustable so the backpack can be fitted to your child’s body. Dr. Elton Clemence practices at Family First Chiropractic located at 142 Erickson drive in Red Deer. Call us today to make an appointment (403)347-3261 or visit us at www.family1stchiro.ca.